After a long day’s work, what better way to spend your nights than lounging on your porch while sipping wine and reading a good book. Imagine hosting an intimate party with a few good friends while the cool breeze and starry sky serve as your backdrop. If this sounds ideal to you, then it’s time to hire a trusted deck builder? We all want that perfect spot at home where you can simply laze around and relax after a long day. If you are thinking of sprucing up your patio or would just like to have a beautiful deck at home, we can definitely help you with that. With simple roof repair and a few other tricks, you can bring out the best of your patio while showcasing your creativity. Today, your roof repair experts from Home Pro Exteriors, Inc. shares some tips on how to design your deck for that perfect look. Tip #1: It’s all about the right design elements. You don’t need to turn your home into a construction site just so you can have your dream patio. The trick is to simply work with what you have by adding some elements that will complement its overall look. Choose a solid theme and work from that. Tip #2: Make it cozy but not costly. You can make your patio extra cozy by adding some garden furniture like a hanging chair or a porch swing. Choose a color that’s both cool and easy on the eyes. You can also throw in some colorful throw pillows to make it more homey and comfy. For cold nights, keep yourself warm with a do-it-yourself fire pit. You can put some paving stones around that can hold the fire pit steady, so you can enjoy a simple bonfire with your friends and loved ones. 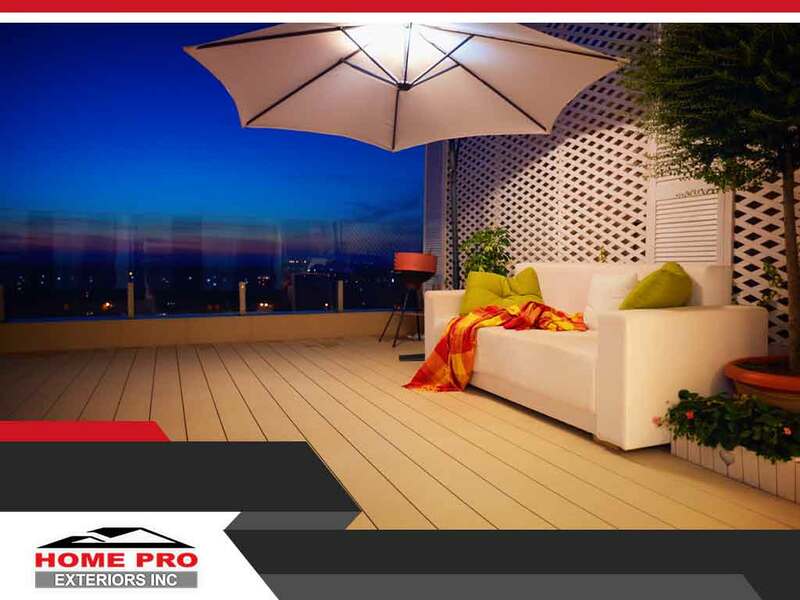 Make beautifying your deck at night your next home improvement project with the help of HomePro Exteriors Inc. As the no. 1 exterior renovation expert in Warwick, NY, it’s our mission to make your dream patio come to life. What are you waiting for? Contact us now at (845) 747-0035 for all your deck and roof replacement needs.